I do a lot of traveling for my profession. That is the nature of being an operating principal in the world of private equity for ParkerGale — we have to be where our portfolio company is. With that, I spend a lot of time in the air, in and out of airports, trains and cars and of course I am no stranger to the new warrior on the road Uber. With all this time traveling you would think there wouldn’t be much time for work. Quite the contrary — travel is when I get most of my backlog cleared out. For this piece, I am going to focus on the hardware side of things with the follow up entry on some hints and tips for handling digital content on the move. I have my laptop bag (or WGB as my partner-in-crime Jim calls it) that is pretty much my mother’s handbag — in that it has everything for every situation. I travel with all manners of cables, for different situations and countries. But that is just a small part of the tale. I have a whole host of untold treasures here, including a full change of underwear and toiletries should an overnight stay be sprung on me. But let us talk hardware — what do I travel with technology wise? I am a bit of a Samsung fanboy; but I like to think I cancel out at least one Apple fanboy. Laptop wise, it is Samsung’s top of the line Ultrabook, with around 8 hrs of battery, touchscreen and SSD. I have recently replaced its battery and it’s been given a whole new lease of life to it. 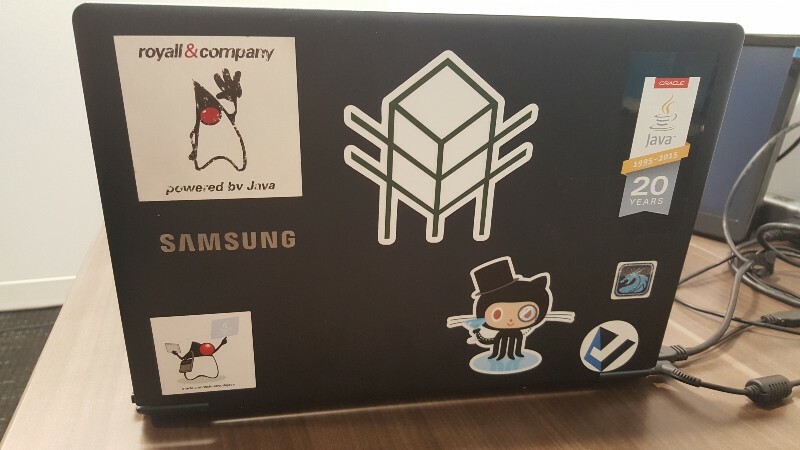 I am of the school of thinking that stickers on a laptop cover is perfectly acceptable and is the modern day equivalent of country stickers on luggage. Each sticker has a story to tell and lovingly assigned a sacred place. Many of those stories will be untold, but I know them and that is all that matters. Phone wise, Samsung Note 5. With my case protector it looks a little big to the casual onlooker, but with its stylus, large screen and high-end camera, it is a fast sleek work house that is never away from me. I have dropped it more times than I care to put a number on, but the case, has allowed it to bounce energetically across many a tarmac or airport terminal floor unscathed. Function over fashion wins every-time. Tablet wise, Samsung Tab S2. Every time I pick it up I still can’t believe how light it is. My tablet is with me all the time and is used at times when I want a large form factor to read or do some research surfing. I also have a Kindle reader, which to be honest, hasn’t been used that much of late. I think that is largely down to the fact the tablet is providing that role for me. I have a number of magazine subscriptions via Kindle and they are best enjoyed on a bigger (color) screen. Music wise, I have a Bose SoundLink bluetooth USB speaker that also serves as a high quality conference line. It has been used in a number of deal meetings with the attention to high end audio one demands from Bose. Next to that is my faithful, LG around the neck, bluetooth headset. Naturally one has to travel with a couple of spare battery chargers. I have a small one that is good to recharge the phone a few times and a much larger one that can recharge everything at once a few times. Network wise, I have a Verizon JetPack MiFi unit that acts as my WiFi hub for my tablet and laptop when at times I need a network. It has got me out of many a situation and works far better than sharing my network via my phone. It shares the same data plan as my phone. Coincidentally, both the MiFi and Bose devices are backup battery chargers as well. So I am well covered should my phone, tablet or headset crave some power. The one thing I do have that gets a lot of use, is my Microsoft Bluetoothfoldout keyboard. I absolutely love it. I have it paired with my phone and tablet, and it is my tool of choice when flying. 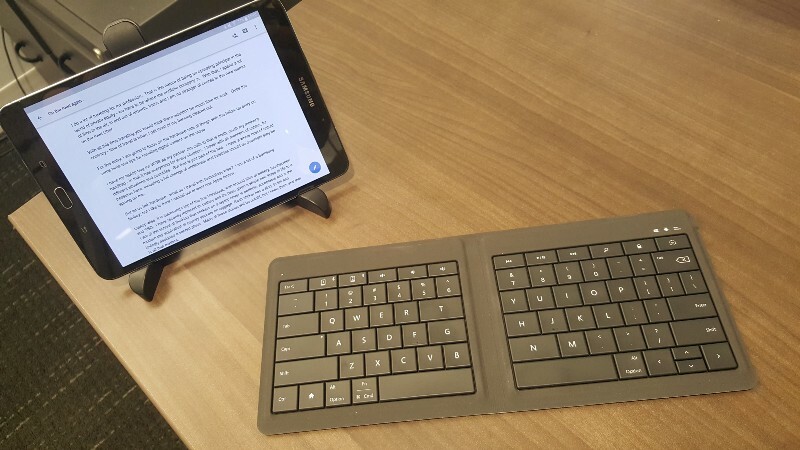 Instead of getting out the laptop and all the heft that comes with it, nothing beats unfolding the keyboard and start typing into my phone or tablet. I will generally do emails on my phone, so as soon as I land, emails are sent when phone reconnects to 4G. I will use my tablet if I am composing a document or presentation on Google Docs. This setup has proved the fastest and smallest. I can crank through a ton, and still have room on my airplane tray for drinks and even a little food should one take the notion. Anyone that travels knows, as soon as the laptop comes out, you have lost all tray real estate. What is also nice about the Microsoft Keyboard is the feeling of a real keyboard with a hearty responsive click. My fingers are a blur, and with the big screen of my Note 5, I focus on the email in question without eye strain. I would also recommend a good foldout stand. I have been through a number and my current one, while looks a little big, handles tablet and phone alike and is sturdy enough to handle turbulence and the odd hostess trolley bang without throwing the device it is lovingly cradling to the floor. Travelling can be a pain and many see it as lost productivity. But with a little planning, careful choice and familiarity with hardware you can make it an productive environment. In my next entry, I will take you behind the software side that supports this nomadic life style.